You've got to go back a long way to find an event that would make the central premise of 12:08 East of Bucharest [A fost sau n-a fost?] work in a British setting. At it's heart is a question that's being asked of a Romanian town by one of their own citizens: did the local people take part in the 1989 revolution that saw Nicolai Chauchescu removed from power? It's all a matter of timing. Chauchescu's departure took place at 12:08 on 22nd December 1989. If the people took to the streets before that time then they were part of the nationwide uprising, if they did so afterwards then the act was merely one of celebration. Posing the question is ex-textile engineer Virgil Jderescu, who now runs the town's micro-budget TV station and hosts a regular show on which this very issue is to be discussed. 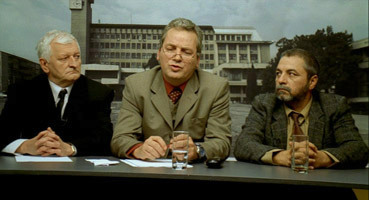 To contribute to the debate he has invited two guests from the local populace, alcoholic teacher Tiberiu Manescu, who appears to owe money to just about everyone, and the elderly Emanoil Piscoci, a last minute replacement who is waging a small war on firecracker-throwing kids. Director Corneliu Porumboiu spends the opening half-hour flitting between the three men as they go about their business on the morning before the show, each scene captured in a single, static wide shot, an approach that works far better than such a simple description may suggest. 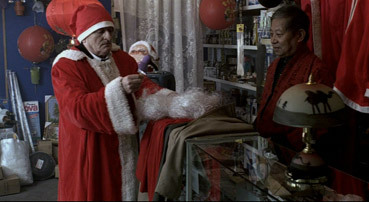 As Jderescu makes his irritable preparations, Manescu takes stock of another evening's alcoholic stupidity and Piscoci is persuaded once again to play the role of Santa Claus, grumpily complaining about the quality of his costume to a local Chinese trader, a man Manescu has once again drunkenly insulted and has to humbly apologise to in order to borrow more money. Despite the opening images suggesting a town on the verge of being upgraded to city status, there's the sense that this is a small community, one in which everyone knows everyone else, or is at the very least aware of them. Having established his observational cinematic style in this extended set-up, Porumboiu then switches tack in a manner that first-time viewers would do well to be ready for. It's handy to know in advance, for instance, that the studio debate that kicks off just over a third of the way in is not a brief narrative interlude, but where the remainder of the film takes place. And if you've tuned in for the cinematography (you haven't, have you?) then be aware that this final 50 minutes is presented exactly as it would be to the TV audience, shot head-on by two cameras managed by a single enthusiastic but clumsily inexperienced young operator. Knowing this could prove for some a make-or-break decision on whether they're prepared to give the film a go, but trust me, it not only works, but also adds a layer of technical amusement to the character comedy. Porumboiu commendably resists the temptation to play it loud, and all the ammunition to do so is there in the studio's do-it-yourself production values, Jderescu's unpolished delusions of professionalism, Piscoci's inability to concentrate for more than a few seconds at a time, and Manescu's increasing agitation at the string of callers who refute his claim that he was in the town square before the appointed hour. It's tempting to describe the film's low key approach to comedy as gentle rather than laugh-out-loud, but openly guffaw I did on a number of occasions. Old man Piscoci pretty much steals the show, and once installed in the studio he functions as a deadpan funny man to his irritable companion's discomfort, slowly leaning over to check his position in frame, staring in contemptuous confusion at Jderescu's hilariously bumbled attempts to intellectualise the situation with borrowed quotes from a dictionary of mythology, and folding an origami boat that he then begins pushing around the desk, unnoticed by the show's host until the vessel is suddenly snatched by the off-screen cameraman (whose departure from his post is announced by just the right amount of picture wobble). This unforced humour is also to be found in the first third, particularly in the dialogue and delivery – I'm having to take the accuracy of the subtitles on face value, but those responsible have certainly caught the flavour of the film's straight-faced approach. There's a serious side to the debate, of course, with the issue of claimed participation in key events having caught a few politicians out over the years and provided fake street cred for media figures looking to play down their wealth and fame and sell themselves as politically right-on. In the accompanying interview, director Porumboiu suggests the story is also about the fragility of memory, the way people recall events differently from each other, recollections reshaped in part by how we want to believe they played out. Romanian cinema at present appears to be in a state of international ascendance, the justifiable acclaim that greeted last year's The Death of Mr. Lazarescu likely to be equalled or even topped by the extraordinary 4 Months, 3 Weeks and 2 Days when it's released here in January. Bowled over though I was by Lazarescu, its partial mirroring of my father's final days at the hands of our own health service made it difficult for me to appreciate its blackly comic undertones, to the extent that I began to wonder if Romanian humour is so specific to its locale that it simply does not travel. But as 12:08 East of Bucharest most engagingly demonstrates, when characters and comedy click, they are truly international. Another fine transfer from Artificial Eye, and 12:08 East of Bucharest hardly makes it easy, a low budget film short partly in dimly lit apartments in midwinter, the rest in the deliberately flat lighting of the makeshift TV studio. The sharpness is good and contrast for the most part solid, though occasionally harsh enough to make me wonder if it was shot on HD. The framing is 1.85:1 and the picture is anamorphically enhanced. Dolby stereo 2.0 only on the soundtrack front, but very clear and with distinct separation. This is not a movie to show off your sound system, though the studio band rock the room in lively fashion. The gently spoken director talks in English about the inspiration for the film, the script, the characters, the locations and working with the actors. He also looks back at the revolution and forward to the future of the Romanian film industry and how the country will develop as part of the European Union. You can shave a good few minutes off the running time to accommodate the unnecessarily long extracts from the film. A difficult one to package in a trailer, as this short sell demonstrates. Brief. Not surprising given that this is Porumboiu's first feature. For those catching it on DVD you'll have no complaints with the picture and sound on Artificial Eye's disc, while the interview with director Porumboiu provides some useful background detail. Recommended. * For the record, it did.